We all dream of building wealth, but not all places provide the same opportunities as others. If joining the highest earners is your goal, you’ll probably want to live in a location that offers access to high-paying jobs and affordable housing. To help you plan your financial rise, we looked at job- and housing-related metrics to determine the best places for you to join the wealthy residents at the top of the economic ladder. To create our rankings for the best cities to become wealthy, we looked at seven metrics: the unemployment rate, the rate of high-wage jobs in the city, the growth in the rate of high-wage jobs, the growth in earnings over five years, median housing costs, median housing costs as a percentage of household income and finally the ratio between the income required to be in the upper 20% of earners and the median income in the city. This final metric provides a glimpse at how equal the pay is in the city. A high ratio indicates a big difference between the top earners and the median earner. To learn more about our data sources and how we created the final rankings, check out the Data and Methodology section below. High housing costs may not be all bad - The majority of the cities in our top 10 have high housing costs. But because of high incomes in those cities, those high housing costs are still affordable for residents: No city in the top 10 has housing costs that exceed 24% of income. The U.S. Department of Housing and Urban Development defines 30% as the benchmark for determining whether housing costs in a city are a burden for residents. Tech hubs are good places to become a high earner - While this study does not specifically focus on the tech jobs in a city, it’s notable that a few tech hubs made it into our top 10. San Francisco leads the way, ranking fifth, with Seattle and Austin not far behind. All three of these cities saw a high growth rate for high-paying jobs. San Francisco and Seattle ranked highest and second-highest in that metric, respectively, and Austin ranked eighth. The Western U.S. leads the way - Nine of the top 10 cities, as well as the majority of the top 25, are west of the Mississippi River. One reason that Plano, Texas stands out in helping residents build wealth is its affordability. Median housing costs in the city as a percent of the median household income are the lowest of all 100 cities we considered. Plano also ranks ninth highest for the high-paying-jobs rate. Census data shows that 42.10% of jobs pay at least $75,000. The number of such jobs also grew more than 5% from 2013 to 2017. That’s the 17th-largest growth rate we found for that metric. It’s noteworthy that the unemployment rate in Plano is also the second lowest in this study, at 2.70%. Chandler, Arizona ties Plano for the No. 1 spot. Housing costs in Chandler as a percentage of household income are the 10th-lowest in the study, at 20.7%. The city also scores well when considering metrics like high-wage jobs and earnings growth. Census data shows that 34.70% of jobs in Chandler earn at least $75,000. That’s a top-15 score. The rate of high-wage-jobs growth also increased 5.10% from 2013 to 2017, which makes that the 18th-highest growth rate in our study. Chandler also saw the 17th-highest growth in average earnings, at almost 15%. The biggest reason Henderson, Nevada makes our top three is that it saw the fourth-highest growth of high-wage jobs in this study. Over the five years for which we examined data, the rate of high-paying jobs grew 8%. Overall, 32.30% of jobs in the city are high paying. That’s the 16th-highest rate we found. Earnings grew almost 15% in that same five-year span, another top-20 rate. Henderson also has affordable housing compared to local incomes. Housing costs come out to just 21.70% of the median household income. This affordable housing also makes the city a popular destination for older Americans. Census data shows that housing costs in Scottsdale, Arizona come out to just 19.30% of household income. That’s the third-lowest percentage of the 100 cities we considered. As for job metrics, a large part of the city’s working population is employed. Scottsdale’s unemployment rate is around 3%, a top-five score. The Arizona city also has one of the best rates for high-wage jobs. We found that 44.30% of jobs here pay $75,000 or more a year. That rate, which is seventh highest in the study, has also seen five-year growth of more than 5%. Average earnings have likewise grown 10.94% and have almost crossed six figures: Average earnings in 2017 were $98,992. The cost of living in San Francisco, California is high. At nearly $24,000, housing costs in the city are the fifth highest in the study. However, those housing costs make up just 21.60% of the median household income. From 2013 to 2017, average San Francisco earnings grew 20%, the fourth-highest growth rate in this study. San Francisco has the third-highest rate of high-wage jobs at a whopping 54%. The rate of high-wage jobs is also tied for the highest in the study (with Seattle, below) at 10%. One of the factors that keeps San Francisco from ranking higher is the fact that there’s a wide gap between the city’s median earner and the top 20% of earners. Much like San Francisco, Gilbert, Arizona has relatively high housing costs. But those costs make up only 21% of the median income, bringing it to 12th best in that metric out of all 100 cities in the study. 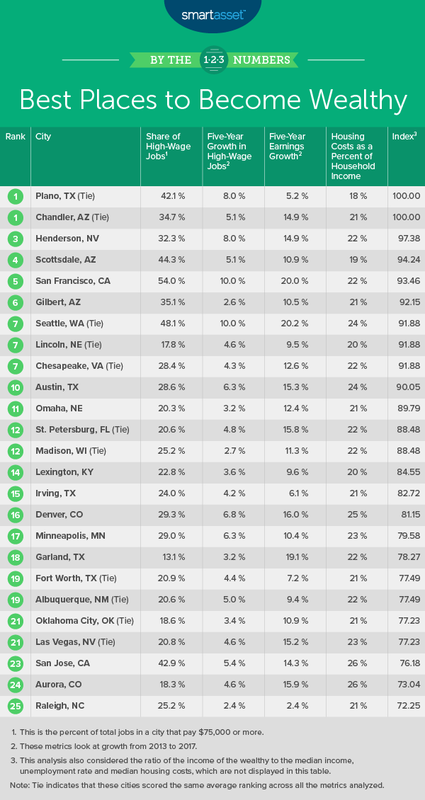 The rate of high-wage jobs in Gilbert, which is 35.10%, is 11th best. Much of the working population is employed, with just 3% unemployed (the fourth-lowest unemployment rate in our study). And the metric for which this Arizona city stands out most is the ratio of wealthy incomes to the median income. That ratio, 1.72, is the lowest in the study. That means there’s a relatively small gap between the median earner and the upper 20% of earners. Seattle comes in as our first of three cities tied for the No. 7 spot. 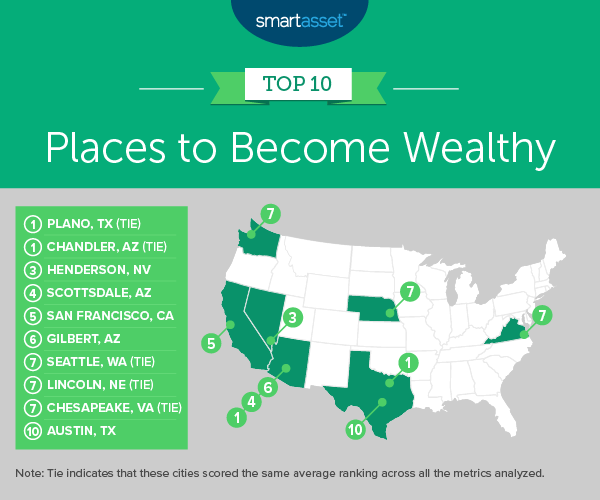 The Emerald city ranks in the overall top 10 thanks to top-10 scores in three of the seven metrics. Nearly 50% of jobs in Seattle offer wages of at least $75,000. That’s the fifth-highest rate we found, a rate that has also grown considerably. From 2013 to 2017, the percentage of high-wage jobs grew 10%. Only one other city, San Francisco, also saw growth of at least 10% in this metric. Along with that job growth, Seattle saw the third-highest earnings growth in the study, at 20.23%. The mean income rose from $78,943 in 2013 to $94,911 in 2017. One reason Lincoln, Nebraska ranks well among the places to become wealthy is that it’s more affordable than other cities on the list. Lincoln’s housing costs help it rank among the 25 lowest for this metric. Housing costs are also less than one-fifth of the median income, at 19.80%. That’s the fifth-lowest percentage in the study. The city’s unemployment rate, 3.90%, also gives Lincoln a top-15 score in that metric. Only 17.80% of jobs in the city pay $75,000 or more, which is low compared to the other 99 cities we examined. But the rate of high-wage jobs here rose 4.60% from 2013 to 2017. That growth brings Lincoln into the top 25 for that metric. The third city ranking seventh in our study on the best places to become wealthy is Chesapeake, Virginia. Most notably, Chesapeake ranks second for its low ratio between the top 20% of earners and the median earner. The city’s rate of 1.73 in that metric tells us that there is a relatively small gap to cross if you want to join the city’s highest earners. Speaking of high earners, earnings for the average worker in Chesapeake grew 12.64% from 2013 to 2017. That’s a top-25 score. The rate of high-paying jobs is also lofty, at 28.40%. And as a promising sign for those looking for a high-paying job in this Virginia city, the rate of high-wage jobs also grew 4.30% from 2013 to 2017, bringing Chesapeake into the top third of all cities for this metric. Austin, Texas has seen robust growth in the rate of high-wage jobs. From 2013 to 2017, that rate grew 6.30%. That’s the eighth-highest growth in the study for that metric. In all, 28.60% of jobs in the city offer high wages. That’s the 23rd-highest rate. Similarly, average earnings have grown more than 15%. If you’re considering moving to Austin, know that housing is also relatively affordable in the city. Housing costs make up less than 24% of the median household income. Ratio of the income of the wealthy to the median income - This is the ratio of the minimum income for the upper quintile (top 20%) to the median income in a city. Data for both income values comes from the U.S. Census Bureau’s 2017 1-year American Community Survey. Unemployment rate - Data comes from the U.S. Census Bureau’s 2017 1-year American Community Survey. Rate of high-wage jobs - This is the percentage of jobs in the city that have an income of $75,000 or more, out of all jobs in the city. Data comes from the U.S. Census Bureau’s 2017 1-year American Community Survey. Five-year growth in the rate of high-wage jobs - This is the change, from 2013 to 2017, in the rate of high-wage jobs. Data comes from the U.S. Census Bureau’s 2013 and 2017 1-year American Community Surveys. Five-year earnings growth - This is the change in average income between 2013 and 2017. Data comes from the U.S. Census Bureau’s 2013 and 2017 1-year American Community Surveys. Median housing costs - Data comes from the U.S. Census Bureau’s 2017 1-year American Community Survey. Median housing costs as a percent of median household income - Data comes from the U.S. Census Bureau’s 2017 1-year American Community Survey. To determine the best cities in which to become wealthy, we ranked the 100 largest cities in all seven metrics. Then we averaged those rankings to calculate a final average. Using the final average for each city, we created our final scores. The city with the best average received a perfect 100, while the city with the lowest final average received a score of 0. If you want to save more money, a budget is a helpful tool. A budget will help you track your spending. Once you know how much you’re spending (and what you spend it on) then you can make changes if necessary. One simple budget to get you started is the 50/30/20 budget. It advises spending 50% of your income on necessities, spending 30% on wants and setting aside 20% for savings. If you’re trying to build savings while also meeting specific financial goals, consider talking with an expert. Someone like a financial advisor can sit down with you to discuss your entire financial situation. Are you trying to save for retirement? An advisor can help you choose investments and build a portfolio. Are you saving for a home or for your children’s future? An advisor can provide guidance. Advisors can also help with specific tasks like tax planning, estate planning or creating a will. To help you find an advisor who meets your needs, we recommend this free financial advisor matching tool.